We have delivered a new supportability tool to speed up the analysis of issues on HR Renewal area in development/test systems. This tool would be useful if you are an HR Renewal consultant. The new report RPPAO_LAUNCHER can be used to access the most used functionalities in the analysis of HR Renewal incidents. On the same screen, it’s possible to access the required reports, tcodes, tables, badis, classes, webdynpro applications…, that are usually checked to solve any issue on HR Renewal. After selecting the PA/PD infotype you want to check, you’ll get some of the buttons de/activated. 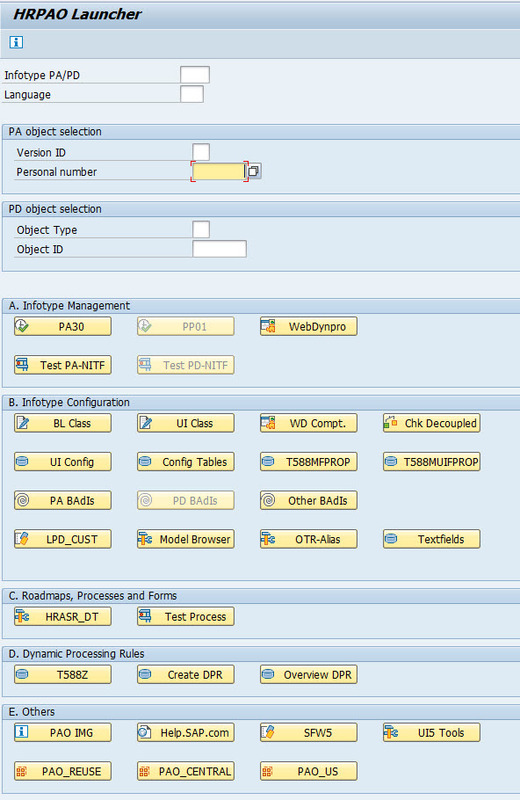 Once infotype and pernr/object id are selected, you can navigate to the most used functionalities: tcodes to manage and configure infotypes, launch processes, check Dynamic Processing Rule, direct access to the documentation or the most used UI5 functionalities. I hope you enjoy this new tool! Wow this is awesome!!! Thanks for the great blog on it.